Washington Post: “Lentils, beyond soups and stews: Have you ever had them like this?,” by Joe Yonan. With the temperatures in D.C. positively Arctic this week, we’re in need for some hot comfort food. So Yonan’s story on this ancient and versatile legume is perfectly timed. In addition to a number of great recipes (Tacos with Spicy-Smoky Lentils sound amazing), he includes a guide to common varieties and their best uses. Los Angeles Times: “How to build a vegetable soup -- with a dozen recipes to get you started,” by Russ Parsons. If the lentils haven’t convinced you it’s team for a steaming bowl of vegetables, this story by Parsons all about building good, simple vegetables soups will have you rooting through the fridge to see what you can concoct with what’s on hand. I like his suggestion to add a little acidity as a finishing touch. I’m getting hungry just looking at the Chickpea and Noodle Soup with Persian Herbs. 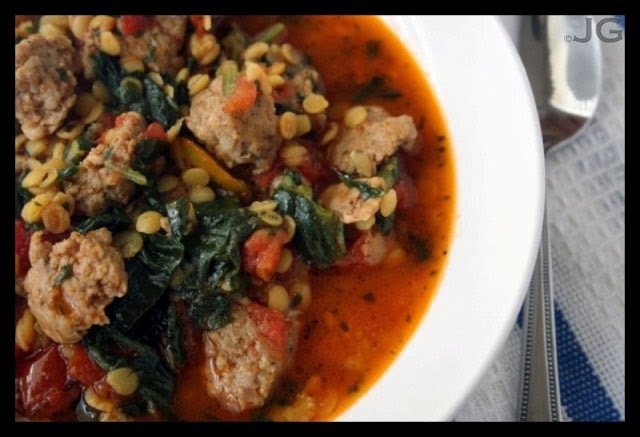 Just Garnished: “Italian Sausage and Lentil Stew,” by Judy G.
From Judy G, a food blogger I often chat with during Monday night #FoodieChats, here’s another great idea for a winter lentil stew, this one using Italian sausage, spinach and a personal favorite canned item: fire-roasted diced tomatoes. New York Times: “Your 2014 Resolution: Drink Adventurously,” by Eric Asimov. The New York Times’ wine writer rounds up an interesting assortment of 20 winter wines under $20, complete with infographic. Food & Wine: “Brussels Sprouts with Prosciutto and Juniper,” by April Bloomfield. Juniper berries are a wonderful vessel for woodsy flavors. I’ve used them in cocktails, like the wintery Walk in the Woods with smoked whiskey. Here, The Spotted Pig Chef April Bloomfield has used them to flavor pan-roasted Brussels sprouts, which sounds like a marvelous idea. Wall Street Journal: "Romancing the Scone,” by Gail Monaghan. Monaghan offers a tasty ode to the popular British tea treat, along with a “foolproof’ recipe. Thrillist: “The Historical Timeline of the Mcdonald's Menu,” by Dan Gentile. It’s amazing that when I was born, McDonalds’ menu had only 6 or 7 items, as compared to the 26 there are today (not counting variations). Gentile has visually documented the evolution and expansion of the popular fast-food chain’s offerings. CNN Eatocracy: “Best and worst food trends of 2013,” by Kate Krader. Looking back at last year, Krader examines the best (cronuts) and worst (ramen burgers) of last year’s food trends. Ramen burgers never seemed like an appealing idea to me. Also: I checked out the New York Times' wine list; adventerous indeed! And I love the photo with this weke's Feed.